1434 is an account of a family’s history, starting with Henry Donaghy in 1803 from County Tyrone, Ireland. 1434 is an account of a family’s history, starting with Henry Donaghy in 1803 from County Tyrone, Ireland. It follows the Donaghy family in the U.S. through unions, development, growth, movement and transitions. The family history is further developed through the memories of Reverend Thomas Donaghy from his childhood in Sharon Hill, Pennsylvania and subsequent service to the Catholic Church. 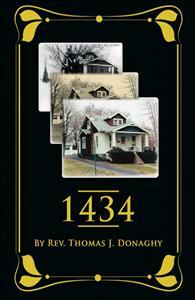 1434 demonstrates the strength of family through tragedies and obstacles as well as the gifts and opportunity offered to individuals by the nurturing, faith and caring of the extended Donaghy family.